Before my relationships with wedding dresses began, I hadn’t given much attention to them as a garment. 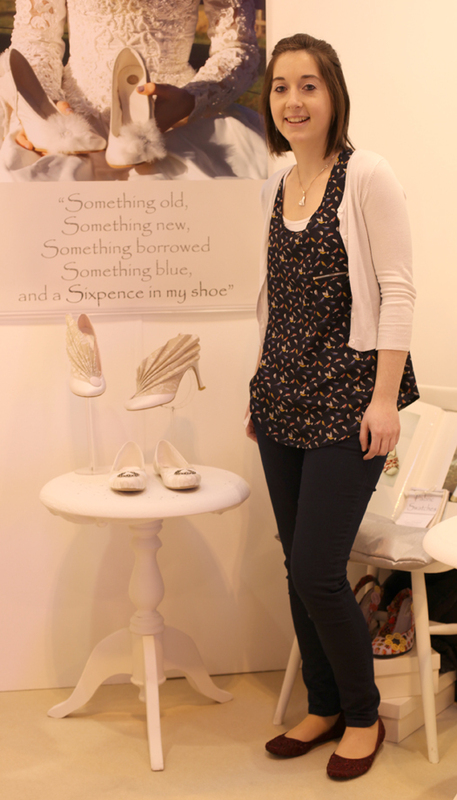 I was working as a trend researcher at the time (2007) when a close friend was getting married and I agreed to go to the National Wedding Show at Earls Court, London, taking my questioning mind with me. Intrigued by dresses people spent thousands on, I put the supportive friend act to good use by trying on dresses myself. To my surprise, one of the dresses, a grey blue silver princess dress no less, with lace trim and diamantes, was a perfect fit. It wasn’t the size, rather a feeling. Even though I was wearing a corset I didn’t think I’d like and so many underskirts I couldn’t find my legs, it was THE one! It was also £4,500, so I thanked the lady saying ‘I’ll think about it’ and begrudgingly handed it back. In that moment, the one where I didn’t want to let go, I got what all the fuss was about. I’d found MY dress. From then on, my collection of far more modestly priced dresses began. 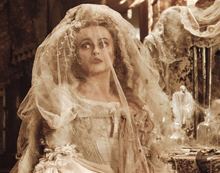 I convinced my friends that I wasn’t planning for my big day, desperate to bag a mate, or moulding myself into Miss Havisham[ref] Miss Havisham played by Helena Boham Carter, Source: Great Expectations – Film, 2012[/ref] (‘You cold, cold heart!). I was curious. So much effort for one day, one special dress, or two if you’re that way inclined. All that money for 12 hours of your life, to take it off, stick in a bag way too small for it and shove to the back of your wardrobe. I wanted to celebrate the wedding dress, with it, in it. We went to parties together. It felt like I was giving second lives to these unwanted dresses, each with their own personality, that I’d found in charity shops or ebay, they were no longer sad when they were with me. They doubled as a series of housedresses; I could come home from work and read in them or casually socialise with friends. Most of my working day was spent wearing black – trousers, shirt with button down collars or a roll neck jumper, which I’d wear with special orthopaedic shoes, also black. Being boyish, with a bowl cut, and a degree in fashion, all that felt okay. But, suddenly, I had enormous silhouetted dresses, with hooped underskirts that changed me, just be putting it on, so extravagant and girly, and white! When I saw the adverts for this year’s National Wedding shows, London and Birmingham, I deliberated my adventures with each of my dresses. A rejuvenated curiosity took over. What’s the market like out there since my first wedding show, the expectations of brides and grooms, and how much are they willing to spend on the big day in this financially wobbly time. During initial research, designers I’d spoken with had told me, they’d stopped making wedding dresses because more and more brides wanted dresses for under £500, which isn’t going to get you very far if you want the finest fabrics and a bespoke dress. Especially if you also want full command of the creative reins, and keep changing your mind, because ultimately, you’re not a designer. 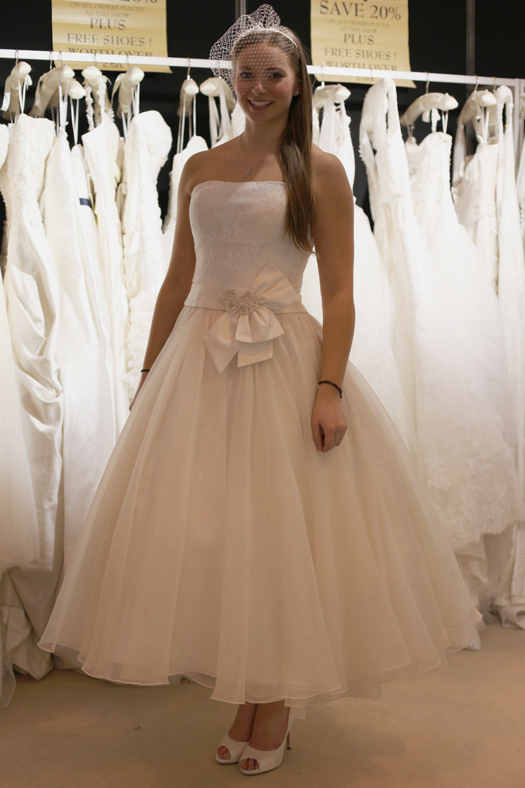 Online, you can buy brand new dresses, ready-to-wear for £12.98,[ref] ‘New stock white/ivory bride wedding dress UK size 6-8-10-12-14-16-18-20-22-22-24 £12.98’ Source: Dream Dresses[/ref] and ‘custom made’ dresses for £55, with corsets, covered buttons, full skits and hand-sewn beading. You’re not going to get the best fabrics, I hate to think what state the boning is in, and I’ve got serious reservations about the conditions they’re made in. At the other end of the scale, Kate Middleton’s dress, undisclosed cost, with high-end fashion the sky’s the limit, so who knows. But, if the dressmakers at Alexander McQueen really did change the needles every three hours and took breaks every half an hour to wash their hands, we’re already well over budget on that £12.98. Inspired, I got on a train to the last day of the Birmingham NEC show, 03.03.13. Looking for a commercial perspective I spoke with stallholders, to hear the current wedding story from their side. 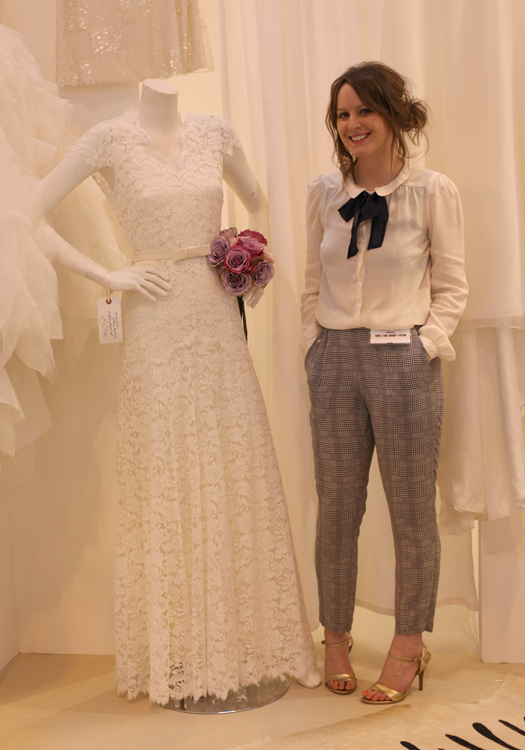 I kept it broad, interviewing people from designer, bridal, menswear, vintage and accessory zones. Do brides and grooms know what they want, and where did they get that idea from? How much are they willing to spend and how are they sold the experience? The Head Office Manager for Connfetti & Lace[ref]Connfetti & Lace[/ref], told me people really like lace and antique vintage feel dresses at the moment. Princess and fairytale styles too. Sleeves have made a comeback since Kate Middleton’s wedding, she said ‘People are looking for sleeves again, dresses went through a very long faze of strapless, off the shoulder, Kate brought it back into fashion that a sleeve does look very nice.’[ref] Source: Address Publications[/ref] Their customers prefer more traditional ivory, she said, in lace and tulle but they also stock satin, taffeta, chiffon or organza dresses with a wide selection of designers to choose from. 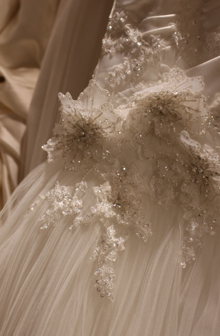 Including; Ronald Joyce, Mori Lee, Ellis, Alfred Sung, Enzoani, Sophia Tolli, and that’s just a few of them. Choice doesn’t seem to be an issue with these classical wedding dresses, and decorative detail[ref] Source: Address Publications[/ref], but do their brides know what they want? Dave, is Marketing Manager for Moss Bros[ref]Moss Bros[/ref]. He says he urges grooms to try things they perhaps think might not suit them ‘It’s about taking a risk, to think, this isn’t something I’m going to be wearing everyday, to come at it from a different angle’ The newest part of the business is Moss Bespoke[ref] Source: Address Publications[/ref], made to order and made to measure suiting. 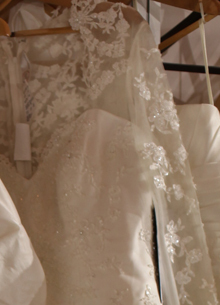 Prices start from £295 which you can personalise by having the bride and grooms name embroidered on the inside pocket, matching buttons and fabrics to the rest of the bridal party. 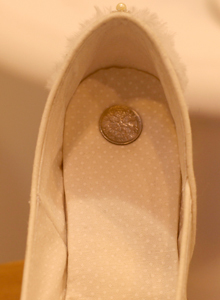 This ranges up to the current average price for a bride to spend on a wedding dress, based on my conversations, £1200. Wide range of cloths and fabrics and a lot of colour too. 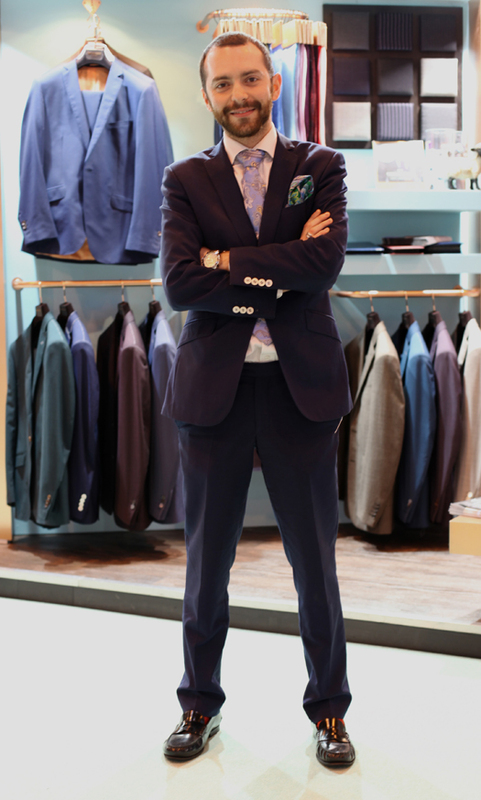 Suits to buy start at £129 and they also offer a hire service starting at £100 for the whole outfit. 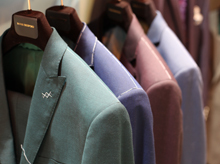 They’ve got a new range launching on 1st May, a suit developed in conjunction with Ted Baker, ‘Tales of the Unexpected’. Although part of the hire range, you can keep the tie & hankie as a gift from Ted. ‘Men are much more conscious now to look their best, something we hear a lot is that guys who are maybe not 6ft tall, think that tales may not be flattering for them, I would argue it the other way that guys who are a little bit shorter can wear tales quite nicely because the curved front gives a graduation between the top and bottom half of the body. Where as some traditional full length or frock coats give a definite distinction between the top and bottom half.’ He said, although women very much seem to be the main planners still, men are much more interested, inspired largely by celebrity culture, in particular sports personalities. And what about the current trends? For the six years that I wore wedding dresses, I was looking for experiences from this special, one day of your life garment, in my more mundane every day environments. All of the participants for this piece have the job of selling that experience, every day, to a new bride or groom, for that one big day. Each customer with his or her excitements, anxieties and knowledge. I could see how each tackle this, from giving a wide variety, sourcing more unique and quality garments, making you one of their family, to a free hankie or six pence in your hand made shoe. Understanding the experience and engaging with your customer to make it happen. Now, how about we take that idea to make every day more special, more quality and more of an experience with our clothes.